Welcome to 2019! As last year came to a close and the new one began I had a bit of time to reflect on how Taste & See has evolved since starting a couple of years ago, and where I see this platform going in the next few months. I am so grateful to every one of you who has been following along as I share my thoughts and experience on the pages of this blog - whether you’ve been following along for years, months, or weeks. 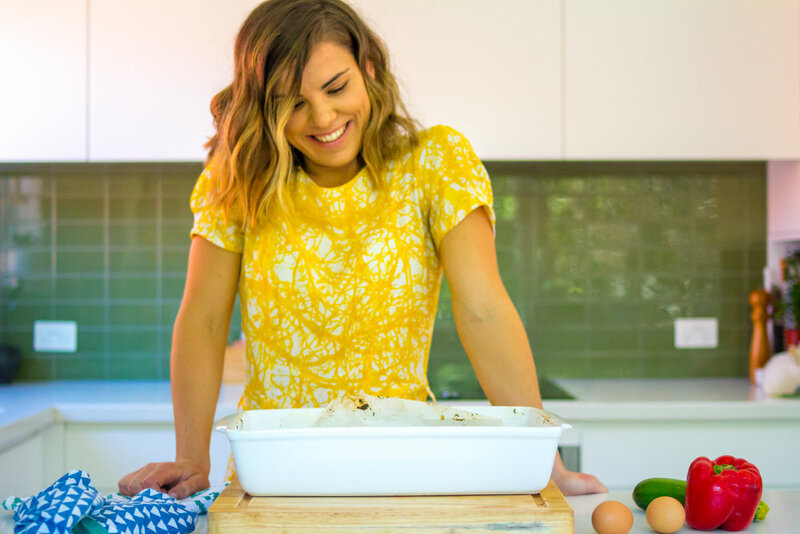 I am really excited to kick things off this year with a new #gamechangers post, featuring the lovely Berleena Eberle, a Health Coach and Intuitive Eating coach based in Australia. In this feature she shares a bit of insight into how she got into the work that she does today, how her approach to food and her body has evolved over the years, and how important stumbling across Intuitive Eating was for her both personally and professionally. I hope you enjoy it! Hi and thanks so much for having me here to share my story Kirstin! My name is Berleena Eberle and I’m an Intuitive Eating Coach. I help women end dieting and binge eating for good. I help them feel freedom and trust in their body so they can focus on more important things in life! You can learn more about the work that I do on my website here. I started my career in media sales but quickly realised my interests in nutrition and started studying online at Institute for Integrative Nutrition to become a certified Health Coach while I held up my 9-5. I transitioned to a health and wellness brand, where a big focus of their online programs was helping people quitting sugar and processed foods. Later, when I was ready to start my own coaching business, I took with me similar wholefoods, sugar-free, paleo, clean-eating values. I thought that was the best way to get clients healthy, well and happy! Now I realised that I was actually complicating things by holding incredibly moral high standards to eating, giving power to perfection and playing to what was “diets in disguise” at the time. The real problem, that only I see now, was that I painfully related to client stories about feeling guilt and body stress about eating chocolate cake at a friends birthday (because it wasn’t sugar-free or paleo). Recognising this stronghold of beliefs that lead to so much food stress, guilt and body dissatisfaction was a real eye opener for me and I knew there was some serious work to do in my own journey and coaching others on that path too. This was about the time I stumbled onto Evelyn Tribole's Intuitive Eating Training and learnt about HAES and the Non-Diet Approach. I deeply connected to the paradigm characterised by respect for your body instead of criticism. Full permission to enjoy all food, instead of restriction & diets. How has your relationship with & approach to food and nutrition changed over the years? Agh YES! Even in my health obsessed days I would eat “healthy” through the day, but at social events or when something unsteady was happening in my life, I’d binge. I’d fall into a spiral of “well there’s not point stopping now!” and go into autopilot/numbing mode. Afterwards, I’d feel so painfully guilty about all the hard work I’d “undone”. I was the girl saying "I CAN’T have that” and "does this thing have sugar in it? !”, because I felt like I had to be “perfect” with my food every day or I'd gain weight. My relationship with food and my body, particularly in the last couple of years, has changed dramatically because I started to deeply work on the mindset side of eating and body image. Over time I have learned how to give myself full, unconditional permission to eat all foods, including Mum’s cakes and biscuits, that I had abandoned in my sugar quitting days. I trust that my head and my stomach can work in harmony. Now I can decide what to eat based on what sounds good, what's satisfying, nutritious, convenient, and letting a different one or combo of those reasons win out depending on how I feel in that moment. That’s what a healthy relationship to food through intuitive eating has given me and what I now share with my clients. What are some of the things that you have enjoyed most about your career thus far? Great question! I love that I get to speak to women on an authentic, raw level. You just don’t have those honest conversations in day to day life. I love that it’s my job to reflect back a clients authentic beauty, to help heal the real problem underneath binge and emotional eating. To help my client dig deeper into her true desires then support through sustainable, mind-body-heart shifts into a more meaningful, joyful life that extends way beyond food and body stuff. What are three of your top tips for staying healthy physically, emotionally & mentally? I know it’s easy to default to the “try harder” narrative right after a binge because it’s so deeply imprinted into our culture to go into fix it mode when we’re “bad” with food. Just trying to stop a binge is not addressing what is actually going on. Consider this, what if binge eating was the symptom not the problem itself? What if we looked at our thoughts, feelings, and behaviours that binge eating has developed in response to, then decided we could support and change ourselves in this way instead? Which leads to my next mindset reframe..
2. What am I making this mean about myself? Understanding that you are the thinker of your thoughts can be a powerful shift away from unwanted thought patterns and behaviours. As the thinker, we give meaning to every experience in our life. We create stories and patterns of thought about weather something, at a basic level, is either “good” or “bad.” So next time you feel crippling shame following a binge, pull out this self-reflective question from your back pocket: “what am I making this binge mean about myself?”. Actively looking at how you believe a binge to be true about yourself is a more effective way to respond to what’s actually going on, over fix it mode, typically leading to restrict-binge cycles. Feedback allows us to adjust our behaviour to how we want to feel. When we ask: “what is circumstance/experience showing me?”, we can look at moments, perceived as positive or negative, through a more proactive lense. We’re able to own our thoughts, feelings, and actions to make choices and move forward. My favourite go-to meal is tray baked veggies with some kind of protein side! I find it so easy to chop whatever veggies are leftover in the fridge like cauliflower, brussel sprouts and potato, lay them out on a baking tray with curry spice, olive oil, salt and pepper and whack them in the oven. On another tray I might lay chicken thighs and smother lemon juice, freshly minced garlic or any other spices in the cupboard. I love tray baking because it’s so easy to prep and serve by topping with a fresh squeeze of lemon juice, fresh herbs, hummus, pomegranate seeds. Easy! This definitely changes all the time but since it’s Summer here in Australia, I’m really enjoying camping with my fiancé and venturing to different parts of Sydney with just a backpack, a precooked curry and rice and a 2-person mini tent! This really takes my mind of everything else going on and forces us to live the simple life, even if just for one night. And finally, an last words of advice for girls (and guys) who want to live healthier, happier lives? Everything you're trying to achieve by having food rules, you get when you give up the rules. The idea of trusting your body can feel scary and foreign, but the process starts by practicing becoming more self aware of feelings, emotions and physical sensations as they arise in the body (and then learning how to respond to them). Becoming more self aware or intuitive definitely isn’t woo woo and I don’t want people to think Intuitive Eating is another set of rules or a diet in disguise that promises to solve all of their problems. The process of ditching diets and becoming an intuitive eater is more about responding to food so that you mostly feel good. Innately, wanting and needing forbidden foods less.